What more could a dog lover ask for? 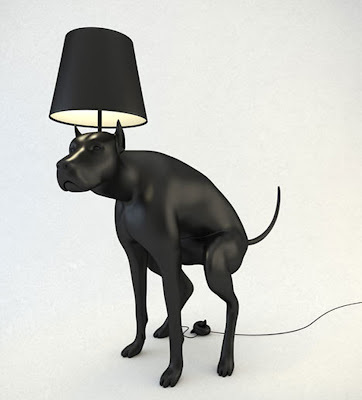 That's right, a defecating dog lamp for your living room. 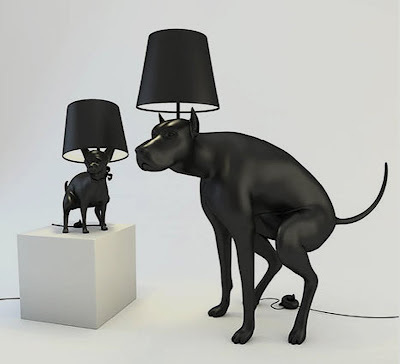 The Good Puppy Table Lamp and the Good Boy Floor Lamp are designed by a Polish born artist who now lives and works in London and goes by the equally funny moniker What's His Name. The two dumping dog lamps, a Chihuahua and a Great Dane, both have On/Off switches shaped as dog turds that needs to be pressed, or in case of Good Boy lamp, stepped on. Awesome! Originally created to be part of London’s the Art Below exhibition on London Underground stations, the lamps were ultimately rejected for being offensive. But that doesn't mean you can't have your own poopy puppy lamp. The artist is making each lamp available in limited numbers.